Electronic Kit School. - This is one way to result the blinking LED light with simple circuit and only need simple and few component like resistors, capacitor, and relays. In here we will show you one of the simple blinking an LED circuit using relays as the main component that switch on and off of LED when controlled with resistors and capacitors. The circuit mentioned look like shown in Figure 1 below. 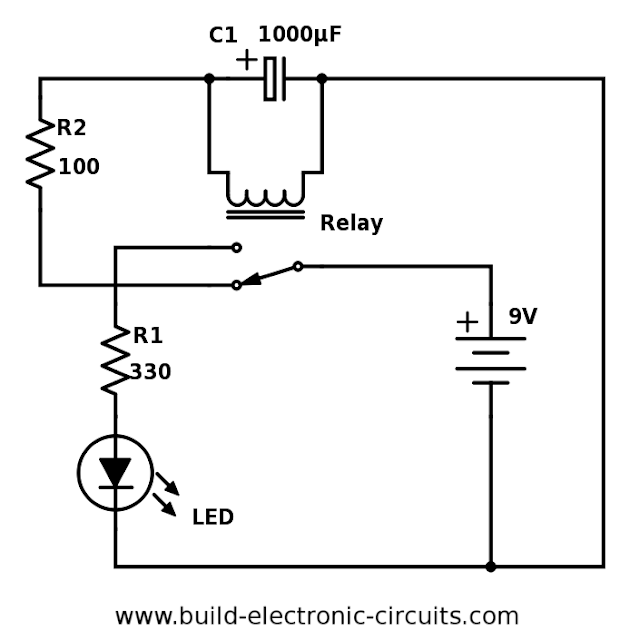 Circuit like in Figure 1 above show you about the simple blinking an LED circuit using relays. From BuildElectronicCircuits site describe that when you apply power to the above circuit, the battery starts charging the capacitor through resistor R2. After a moment, the relay coil pulls the relay into the other position. This makes the LED turn ON. Because the capacitor now is charged, it will hold the relay in this position. But the capacitor only has enough energy to keep the electromagnet in the relay powered for a little bit before it’s empty (or discharged). When the capacitor is out of energy, the relay goes back into its original state and turns the LED OFF again. Then the cycle repeats itself. For this circuit with the above component values I recommend the DS2Y-S-DC5V relay or a similar one.